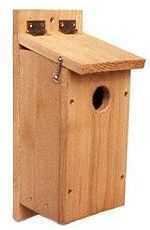 Build the bufflehead nest box with cedar, pine or most any softwood. 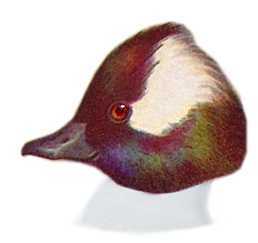 Use wood stock rough-cut on both sides to simulate tree cavities and so birds can grip surfaces. Make a 7″ by 7″ floor (inside dimensions) and a 16″ floor to ceiling height (inside front). Cut a 2 7/8″ diameter round entrance opening located 14″ above the floor (to top of opening). Drill or cut ventilation openings in the floor and under the roof. Make Side Opening Doors for easier access to duck houses. Some attach wire mesh on the inside front panel to help ducklings climb out of the box. If you do, bend the needle sharp ends over and fold behind. A better alternative may be to use plastic poultry or snow fencing, or similar material. Some attach wire mesh on the inside front panel to help ducklings climb out of the box. If you do, bend the needle sharp ends over and fold behind. A better alternative may be to use plastic poultry or snow fencing or similar material.